Prof. Romila Thapar, one of the world’s leading experts on the history of early India, is currently Professor Emeritus in History at Jawaharlal Nehru University, New Delhi. 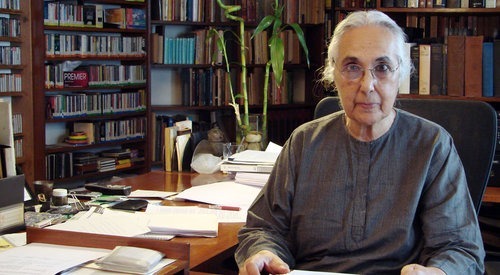 Prof. Romila Thapar is also an Honorary Fellow of Lady Margaret Hall, Oxford and has been Visiting Professor at Cornell University and the University of Pennsylvania as well as the Collège de France in Paris.She was awarded the prestigious Kluge Award For Lifetime Achievement in the Study of Humanity in 2008. Her immense contribution to the study of early India has been internationally recognised, and she has received honorary degrees from universities across the world. She is the author of Asoka and the Decline of the Mauryas (1961), A History of India (1966), Ancient Indian Social History: Some Interpretations (1978) among many other of her well known works. Dr.Talat Ahmed, Vice Chancellor, Jamia Millia Islamia and noted Earth Scientist, began his career with the Geological Survey of India and worked for two decades as a scientist with Wadia Institute of Himalayan Geology, Dehradun. He is the recipient of several prestigious fellowships in the field of Sciences, has over 65 research publications to his credit, and has the exceptional distinction of being a Fellow of all the Science Academies of the country.